Louis Sebille was born on November 21, 1915, in Harbor Beach, Michigan. During the late 1930's and early 1940's, he worked as a master of ceremonies in several Chicago nightclubs and went by the name Lou Reynolds. He entered the Aviation Cadet Program of the U.S. Army Air Forces on December 20, 1941, and was commissioned a 2d Lt and awarded his pilot wings at Lake Charles, Louisiana, on August 4, 1942. His first assignment was as a B-26 Marauder pilot with the 450th Bomb Squadron of the 322nd Bomb Group at MacDill AFB, Florida, from August 1942 to January 1943, and then deployed to England, and later France and Belgium, from January 1943 to March 1945. During this time he flew 68 combat missions over enemy-held territory in Europe. 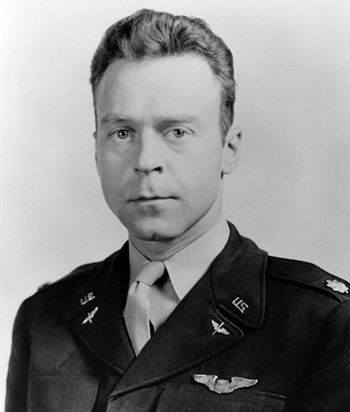 Maj Sebille attended the Airborne Radar Familiarization Course at Orlando, Florida, from March to April 1945, and then attended Command and General Staff School at Fort Leavenworth, Kansas, from May to July 1945. He served as assistant director of operations and training with the 621st Army Air Forces Base Unit at Pinecastle, Florida, from July 1945 until he left active duty and joined the reserves on November 5, 1945. Sebille flew as an airline pilot from November 1945 until he was recalled to active duty on July 10, 1946, and then served at Barksdale Field, Louisiana, Langley Field, Virginia, and Biggs Field, Texas, from July to November 1946. His next assignment was as a flying safety officer with the 309th Base Unit at Greenville AFB, South Carolina, from November 1946 to August 1948, followed by service as a staff officer with Headquarters 18th Air Base Group at Clark AFB in the Philippines from September to November 1948. Maj Sebille served as commander of the 67th Fighter-Bomber Squadron of the 18th Fighter-Bomber Group at Clark AFB from November 1948 to June 1950, and then deployed to Ashiya AB, Japan, and Pusan East, South Korea, in support of the Korean War, from June 1950 until he was killed in action on August 5, 1950. Louis Sebille was buried at the Forest Home Cemetery in Forest Park, Illinois. Maj. Sebille, distinguished himself by conspicuous gallantry and intrepidity at the risk of his life above and beyond the call of duty. During an attack on a camouflaged area containing a concentration of enemy troops, artillery, and armored vehicles, Maj. Sebille's F-51 aircraft was severely damaged by antiaircraft fire. Although fully cognizant of the short period he could remain airborne, he deliberately ignored the possibility of survival by abandoning the aircraft or by crash landing, and continued his attack against the enemy forces threatening the security of friendly ground troops. In his determination to inflict maximum damage upon the enemy, Maj. Sebille again exposed himself to the intense fire of enemy gun batteries and dived on the target to his death. 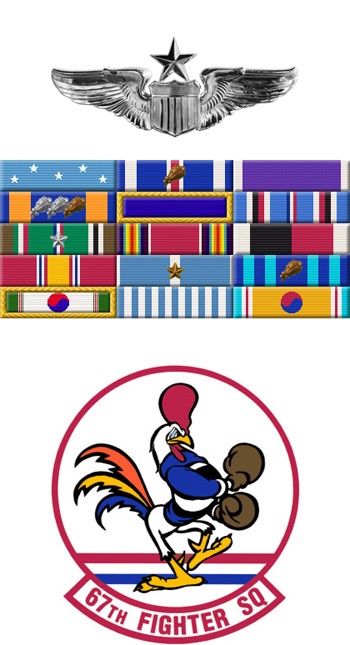 The superior leadership, daring, and selfless devotion to duty which he displayed in the execution of an extremely dangerous mission were an inspiration to both his subordinates and superiors and reflect the highest credit upon himself, the U.S. Air Force, and the armed forces of the United Nations.